Messerschmitt Me 163, shown in rear view. Credit: U.S. Air Force. The Messerschmitt Me 163 was a German rocket-powered fighter aircraft, also known as the Komet, designed by Alexander Lippisch (1894–1976). Lippisch had been working on rocket planes since 1932, when he designed the Delta 4 aircraft, which became, in 1955, the Delta 4a. By 1940, his DFS 194, powered by a Walter 600-pound-thrust hydrogen peroxide engine, reached 340 miles per hour. The Messerschmitt Me 163A followed in the spring of 1941, when engineless tow tests were made at Augsburg. Its rocket motor was installed in the early fall, and flights were made at speeds up to 640 mph from the Peenemünde airfield. The larger Me 163B was built around a more powerful Walter hydrogen peroxide-hydrazine hydrate/methyl alcohol engine. Tests of the new aircraft were held in 1943 at Bremen, Augsburg, Brandes, near Leipzig. Two 1,000-pound-thrust JATO units helped get the airplane of the ground. About sixty of the aircraft were built by Messerschmitt. 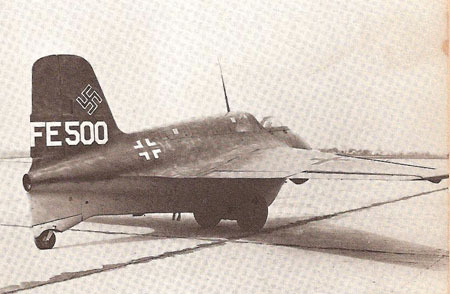 Junkers built three hundred C models of this aircraft, which was called first the Ju 262, then the 8-263, and finally the Me 262, when Messerschmitt continued its development. The C model was glide-tested, but never flew under rocket power. The B model was 19.5 feet long, weighed 9,040 pounds, and could fly for less than 8 minutes at 550 mph; it could also climb to 32,800 feet in 3 minutes. The thrust of its throttlable engine varied from 660 to 3,500 pounds. The C model was 23.1 feet long, weighed 11,280 pounds, and was planned for an engine whose thrust varied from 440 to 3,740 pounds.